If you want to understand the Honda Accord Crosstour, it helps to take a short trip back in time. When the BMW X6 hit the market two years ago as the world’s first “Sports Activity Coupe,â€ we thought everyone in Munich must have been drinking from the same bottle of crazy juice. So bizarrely contrived in its inability to really be a sport-ute or a coupe when its goal was to be both, we never thought the idea would catch on. Now, we’re not so sure. Honda’s new Accord Crosstour sits a bit lower, but the profile is very much the same. The front half is the familiar shape of an Accord – albeit one that sits a bit taller – but towards the rear it tapers into a strange hatch shape that seems like a partial throwback to the Honda CRX of the ‘80s, albeit stretched over a bulbous four-door body. Inside you get the benefits of a command seating position and easy cargo access – general SUV traits – and outside you get a car that’s lower to the ground and easier to park. Sounds suspiciously like a station wagon to us, but because the marketers won’t go anywhere near that word in North America, these new, more polarizing designs are becoming more common. Honda seems to especially like the “crossover coupeâ€ design, as they have recently released an X6-shaped vehicle for their Acura luxury brand called the ZDX as well. They’ve been known to do their homework, so chances are they’re on to something here. The command seating position is the primary reason most consumers purchase crossover vehicles, and we like the idea of a lighter weight, easier-to-navigate vehicle. Easy access to cargo and the extra rear storage space also comes as a big plus. If you don’t need all-wheel drive, highway fuel economy gets a boost to the high 20s. Styling will prove polarizing, and the design really is a love-it-or-hate it proposition. The button-heavy interior can be a turn-off for some, and the navigation system is beginning to show its age in the graphics department. Rear headroom feels limited by the sloping “coupe styleâ€ roof. 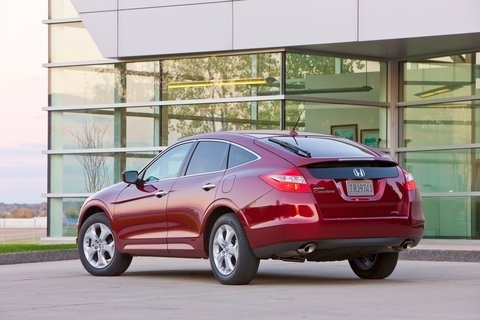 Much like its Accord namesake, the Crosstour cruises effortlessly around town and has mostly sedate on-road manners. The steering ratio has been slackened up a bit to move the Crosstour closer to its SUV and crossover competitors, but the helm remains responsive and decently weighted. But the larger body of the Crosstour adds 300 lbs over a similarly equipped Accord EX-L, and that’s without all-wheel drive, which tacks on another 200 lbs, taking the grand total to a very pudgy 4,070 lbs. All that weight is tough to hide, a fact that presents itself every time you go to accelerate hard. Despite its impressive 271 horsepower output, the Crosstour has trouble hiding its mass, and the engine really has to rev to make brisk forward progress. The all-wheel drive system feels especially bulky, but if it’s a utilitarian vehicle you want with the responses of a heavy Accord, there’s little doubt you’ve found your vehicle. 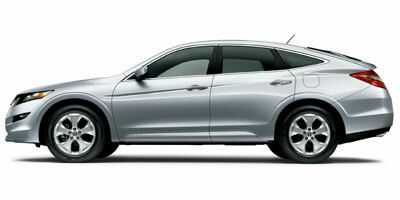 The Honda Accord Crosstour is powered by a 3.5-liter V-6 engine that’s good for 271 horsepower and 254 lb-ft or torque. Power is driven to the front wheels or, optionally, to all four, via a five-speed automatic transmission. Honda’s Real Time four-wheel drive system, only available on the top-of-the-line 4WD EX-L, manages power efficiently by maintaining front-wheel drive when grip is available and only switching to all-wheel drive when slip is detected. A six-disc, 360-watt audio system with seven speakers comes standard. Honda’s navigation system raises the MSRP of the Crosstour $2,200, and adds a digital screen housed in the center stack. The system boasts voice recognition and points of interest with Zagat ratings, though the display is a bit difficult to navigate and lacks in the graphics department. Homelink remote, Bluetooth hands free, power seats and a remote entry system all come standard on the 4WD EX-L. Given its extra weight, the Accord Crosstour boasts impressive fuel economy numbers in front-wheel drive form, returning 18 mpg city, 27 mpg highway. All-wheel drive takes those numbers down to 17 mpg city, 25 mpg highway, and the engine is emissions rated at a green-friendly ULEV-II. If you’re familiar with the Accord, you’ll feel right at home in the Crosstour, as the cabin is essentially a carryover with a higher seating position. The center console is button-heavy, though easy enough to learn, with climate controls flanking those for the audio and navigation systems. If anything, the Crosstour can be called easily distinguishable. The front grille is prominent to say the least, leading into a long hood and high beltline that carries through to the rear. The sloping coupe-like roof helps the Crosstour hide its size, although from the rear it looks more crossover SUV than car. The Honda Accord Crosstour starts at an MSRP of $34,020 before destination fees, jumping up to $36,220 when equipped with navigation. It’s tough to peg anything as a direct competitor, though the $30,995 Subaru Outback 3.6R Limited and $29,550 Toyota Venza AWD V-6 come close. 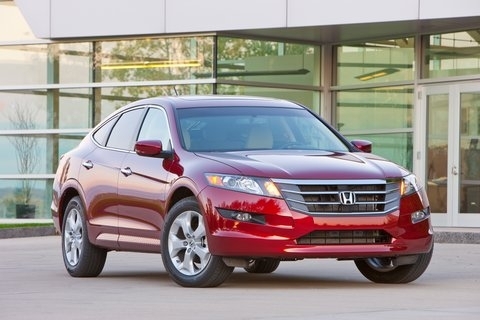 Neither truly a wagon or crossover, the Honda Accord Crosstour is an interesting proposition. It offers plenty of utility and reliability, though what it gains in style it loses in rear seat headroom and overall cargo capacity. Then again, it doesn’t necessarily have any “trueâ€ competition. Maybe that was the idea all along.